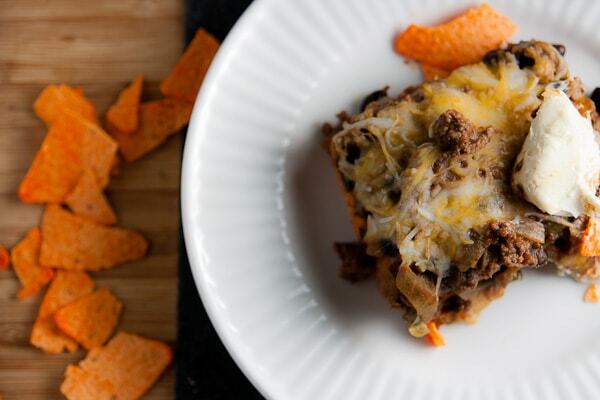 "Doritos Locos" Taco Bake | Healthy. Delicious. 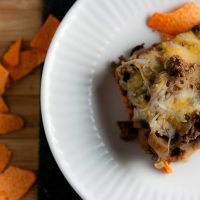 Doritos Locos Taco Bake. Yup, I went there. And you know what? I don’t regret it at all. Those folks at Taco Bell were really onto something. I’ll be honest – Taco Bell totally grosses me out. I stopped eating there long before the whole “our meat isn’t even meat” scandal and I don’t have plans to start any time soon. But I just had to see what all the fuss about Doritos Locos Tacos was about, so I took matters into my own hands. 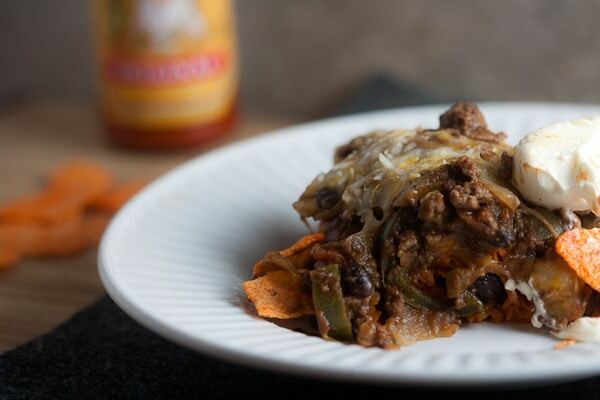 Taco bake is one of my most popular recipes, and all it took were a few small tweaks to give it a new look and feel. WOW. Where has this been all my life? Unlike the tortilla chips that my original recipe calls for, baked Doritos stay nice and crispy even after they’re topped with meat, beans, salsa, and cheese. Their cheesy flavor is also bold enough to stand up to other big flavors, so beef works much better in this version too (I prefer to use ground chicken in the original). I like to keep the flavors big and bold by using the hottest salsa I can bear – usually a mix of half of a generic store brand hot salsa and half Mrs. Renfro’s Ghost Pepper Salsa. Top it off with some Cholula and sour cream, or some guacamole and chow down. Can you please let me know the size of the “casserole pan”? Thanks! I think mine is 9 inches but 11 inches, but smaller would be ok too. Husband was impressed! I roasted some more jalapenos and onions and chopped them up to put as part of our toppings and he gobbled it up! It was spicy for me, but just perfect for him. After his first serving, I saw him sneak back up and grab a little more–a mark of a great recipe! Lauren, you nailed it! I will prepare this for “Game Day Party”..Looks delish!! Good Dish to take elsewhere!! OK this says serve 6, at the bottom it says to cut into 8 servings? I’m confused. Do you know how many WW points plus this recipe is? I fixed this last night for my hubby and I and it was delicious and easy breezy. Thanks so much for the recipe. 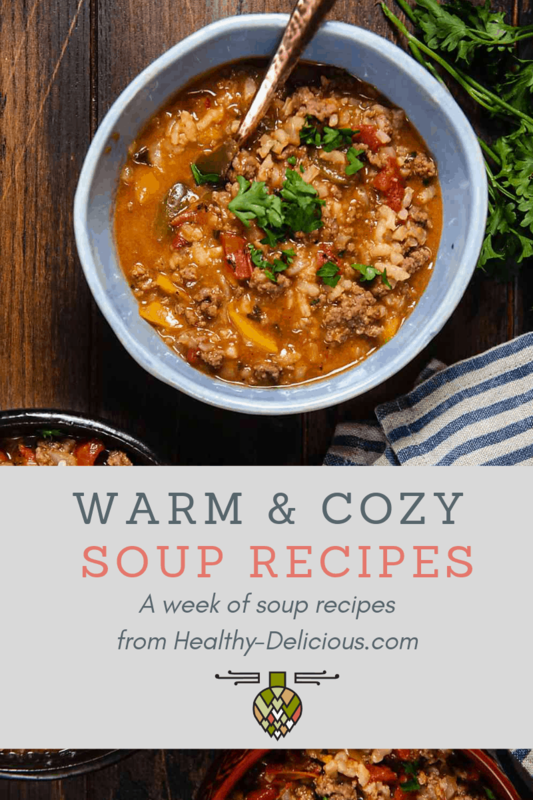 I’ll certainly put it into the rotation for the quick, easy and yummy weeknight dishes. 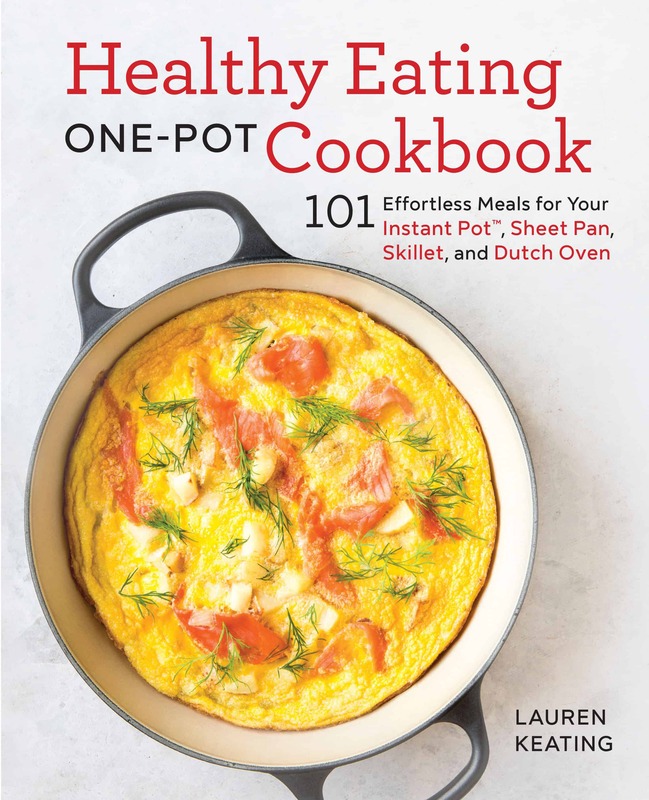 This looks really good, like something my husband and I could really dig into while watching TV on a Friday night. Can’t wait to try it! This looks incredible! And I don’t even have to tell the Hubby it’s healthy!